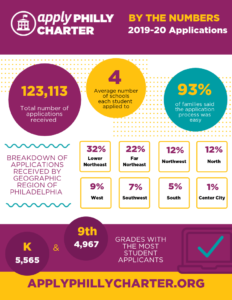 Philadelphia – On January 28, 2019, the application window closed for families to apply to most Philadelphia charter schools for the 2019-2020 school year on one website—applyphillycharter.org—with just one application. Launched by 71 public charter schools in September, 2018, Apply Philly Charter not only provided families with a new, easy-to-use common application system, but it also streamlined application and school notification deadlines. The public charter schools on Apply Philly Charter will now hold their lotteries and notify families no later than February 19, 2019 about the status of their application. Families can still apply to schools on Apply Philly Charter after the January 28, 2019 deadline. If there are no seats available, they will be placed on a school’s waiting list. Schools will contact families if there is any availability for the 2019-2020 school year. If a student has been accepted by a public charter school, families should follow the school’s enrollment process to secure their seat for the 2019-2020 school year. Once a family enrolls their student in a school for the 2019-20 school year, they should let all other schools they applied to know so their seat or spot on a waiting list can be freed up for another student. The application window for the 2020-2021 school year will open in September of 2019. Even more Philadelphia public charter schools will be on Apply Philly Charter next year. Philadelphia School Partnership (PSP) manages applyphillycharter.org and provides technical support to the participating charter schools.